Posts related to quality in health care. Clinical Quality, the #4 priority in health care. If you refer to the front page of this website, you’ll see that I am placing Clinical Quality #4 on the list. This is referring to the quality of the care that is being delivered to you, the patient. In a series of upcoming posts, you will see why this is #4. My definition is simpler: The right thing happens at the right time, in the right place and without defects. Do you notice how relatively ambiguous the IOM definition is? Sort of sounds like political gobbledy-gook, doesn’t it? Yup, that’s how the medical community and industry talk about quality. Before delving into the details, it’s helpful to know some of the history. Before 1965, there were no organized quality programs in medicine anywhere. Nope, not even in hospitals. The quality of care was dependent on the culture of a health care entity, like The Mayo Clinic. At the same time, no one was measuring anything, so, clinical quality was mainly based on anecdotes (“ my local doctors weren’t making me better so I went to The Mayo Clinic and I’m better now”). So, let’s go way back. In 1850, Ignaz Semmelweis noticed that post partum women cared for by obstetricians were dying of infections. He noticed that the incidence of these infections was a lot lower in the wards attended by midwives. The difference he noted was, the doctors were tending to other ill patients and doing autopsies, and the midwives only delivered babies. The physicians would come to the labor and delivery rooms or the post-partum wards immediately after working on the ill or dead patients without washing their hands. He theorized that there was something on their hands that was spreading the infections. He didn’t know what that was. (Louis Pasteur figured that out later.) Semmelwies tested his theory by having physicians wash their hands with a chlorinated lime solution. The infection rate plummeted dramatically. Here’s a sentence you’ll see again…His ideas were rejected by the medical community. Florence Nightingale noticed that soldiers did worse in facilities where the conditions were poor and unsanitary. She championed making things as clean as possible, improving hygiene and improving working conditions for caregivers. The death rates plummeted. She also created and promoted standards of care for nurses. Interestingly, she was criticized. Semmelweis and Nightingale were what some people call “heroic” leaders. They worked tirelessly to maintain the improvements they believed were critical to good patient care despite resistance from the medical community. A lot of what Nightingale proposed became ingrained in nursing. Interestingly, except for surgery and OB, Semmelweis’ hand washing went by the wayside. Doctors and nurses and other staff went from room to room without washing hands. I was never trained to wash hands in between patients unless you touched something obviously contaminated or infected. No one wore gloves unless you were doing a sterile procedure. It wasn’t until 1995 that the CDC officially proposed that clinical staff wash hands before entering and upon leaving hospital rooms and outpatient exam rooms. To this day, getting everyone to consistently wash his/her hands is an issue, despite a national call to action about it. Yes, centuries after Semmelweis figured that out, medical staff still don’t consistently wash their hands. These notable heroic leaders pretty much promoted or dictated tasks. Wash your hands, sanitize hospital wards, etc. They didn’t really look at the process of care longitudinally. It was more insert a task or change a task. The task-oriented culture is the Achilles heel of the medical industry. We’ll get to that later. Anyway, with heroic leaders, when they leave, things mostly fall apart unless someone equally passionate about the subject stays behind to sustain it. What is really needed is a “non-heroic” leader. Ever heard the sentence, “Give a man a fish and he will eat for the day, teach him how to fish and he will never be hungry”? How about “some people tell time and some people are clock builders”? A non-heroic leader teaches people to fish, and they build clocks so when they leave, people won’t go hungry and they have a way to tell time. The first real non-heroic-type leader in medicine was Ernest Codman. He was the first to propose measuring things and setting up systems to mitigate errors. This is different than promoting tasks. Codman was a Harvard trained surgeon who was one of the founding fathers the Society of Surgeons, a precursor to the American College of Surgeons. He was practicing successfully at Massachusetts General Hospital when he came up with the idea of what he called “The End Result”. In Codman’s words, The End Result was, “The common sense notion that every hospital should follow every patient it treats, long enough to determine whether or not the treatment has been successful, and then to inquire, ‘If not, why not?’ with a view to preventing similar failures in the future”. This was the first known suggestion that the process of taking care of people should be examined and improved. Codman started keeping ledgers of all of the surgeries performed at Mass General. The other surgeons didn’t like this. The idea was met with a lot of resistance. He was actually hated by other doctors. Codman presented his End Result idea at a Surgeon’s Society meeting where he portrayed surgeons as greedy surgeons grasping for wealthy people’s money. (See, even back then, it seems, it was all about the money). The medical community at Mass General went ballistic. He was asked to resign and was ostracized. Some stories about his leaving Mass General say the other doctors burned his surgery ledgers. Codman opened his own hospital and applied his End Result idea. He wrote books about it including case reports. But, the medical community of the time never adopted his approach. He also was a champion of hospital efficiency, and actually wrote a book about that. But for a long, long time, his ideas were rejected by the medical community. It wasn’t until 1965 that some sort of organized quality program began, and only in hospitals. And it was only because of when the Medicare and Medicaid laws were passed. The laws called for certain standards to be met to ensure beneficiaries were getting appropriate care. Medicare called this Conditions of Participation. It was mostly utilization review, not quality improvement. There weren’t a lot of prescribed details. There weren’t any significant improvements. So Medicare mandated quality programs and started PSRO’s (these were committees of physicians and largely failed to make any impact) and QIO’s (these exist today). In the beginning, the hospitals, searching for something structured on which to base quality programs, chose the malpractice insurance companies’ risk triggers, like, unexpected transfer to an ICU, unexpected death, return to the ER within 2 weeks of discharge, etc. So, the hospitals essentially built their quality programs on events, and did reviews of cases that met the trigger events. This was the bulk of what quality programs did, case reviews. The result was a headhunting culture. The reviews look for who did the wrong thing or the things that resulted in the trigger event occurring. It was a culture of fear, so, clinicians and staff were always trying to hide their involvement in these events. People would be fired, embarrassed, admonished, etc. What was really needed was an analysis of the processes of care within a culture that didn’t start with finger-pointing. It wasn’t until about 1990 that people started to realize that 1. Human beings are error prone and 2. Processes can promote or mitigate errors. This was due to two things, 1. A book called Human Error by James Reason and 2. The emergence of an awareness in the medical community of Statistical Process Control (SPC is based on the premise that 80% of defects and inefficiencies are due to the process, only 20% is due to individuals’ actions). The event that seemed to spur more interest in the above was the beginning of the Patient Safety Movement, which occurred in 1998. Really, it wasn’t until 1998 that the medical community thought you ought to be kept safe from harm from medical “institutions”! As a matter of fact, before WW II hospitals were referred to “pest houses” because you were more likely to die in the hospital from something that happened in the hospital than the disease you had if you had stayed home! Here’s a real story about this. It was 1998. (two years before the IOM’s treatise: To Err is Human) I was the Chief Medical Officer (CMO) of a medium-size regional Managed Care Organization/Health Maintenance Organization (MCO/HMO). (I’ll use MCO from now on for these insurance companies) Once a year, just about all of the MCO’s in the country descended on Washington, DC for a large weeklong conference. There were tracks for different “positions” in MCO’s. There was a CMO track, a CEO track, a CFO track, an Employer CEO track, etc. Near the end of the week, there was a combined MCO CMO-Employer CEO 2 hour session. There had never been a track session like that before. We were ushered into a large conference room with just about equal parts Health Plan CMO’s and Employer CEO’s. It seemed an odd combination for us CMO’s. We were wondering why it wasn’t MCO CEO and Employer CEO. There was a long low stage set up with about 8 “panelists” sitting at a long table. The moderator said the subject of the session was Patient Safety. None of us really knew what that meant, having never heard that term before. I’m sure the Employer CEOs were thinking the same. The moderator said the first thing they were going to do is play a video for us. The video was about a ~11 year old boy. It was December; Christmas was approaching. The child had a “growth” on his ear that the surgeon had recommended to be removed. It was a procedure to be done under local in a same day surgery suite at the hospital. The parents were waiting in the waiting room. Suddenly the surgeon came out and told the parents that the surgery went wrong, there was a complication and the child did not survive the event. The Quality Nurse conducted an investigation and determined that the local anesthetic that was used had 10 times the amount of epinephrine than it should have, and that the anesthesiologist had given the operating surgeon the wrong bottle. The video was stopped and four individuals gave accounts of the events including how they felt about what happened: The mother, the surgeon, the anesthesiologist and the Quality Nurse. It was extremely emotional, the mother obviously still grieving, the surgeon and anesthesiologist guilt ridden, the Quality Nurse compassionate. The bottom line reached by the panelists was, the process, or lack of it, was the cause of this boy’s death. The participants in the process were well-trained and doing what they thought was right. The moderator went through statistics from studies from 1990-1995 about harms and deaths from “medical adverse events”. The moderator then opened the dialogue to those of us in the audience. Of course, we were all stunned. Well, we thought, they actually had the wrong CMO’s in the room. They should have had the Health Care Delivery Systems’ CMO’s. How would we know what was going on day to day in hospitals? The Employer CEO’s said we should be holding the Health Care Delivery Systems accountable, sort of like the Patient Safety Police. The start of the Patient Safety Movement was really a watershed event in medical quality. Although there were some (vast minority) health care systems that had started to adopt and train their staff in SPC (using The Improvement Model or FOCUS-PDCA), there was little evidence that anyone could do it well except for one or two institutions, like Intermountain Healthcare in Salt Lake City. I recall being at a management meeting of a health care system that had hospitals, a medical group and a health plan in 1999 where I presented this emerging Patient Safety Movement. I was sitting next to the Chief Operating Officer of the hospitals. After some inquiry dialogue by the group, the COO said (exact words), “Well, we don’t have to do anything about this right away since this stuff has been going on for years.” Really? Seriously? See why your quality care is #4? Sidebar: I actually took a year of the agendas for the highest management team meetings in an integrated health care system. 95% of the time spent by the most senior management team had nothing to do with patient care. It was mostly budgets, growth, HR issues, IT, marketing, etc. When I showed this to them the CEO said, “Well, we have Quality Committees that deal with that, we don’t need to go over that here.” Really? Want to know why Clinical Quality is #4? Here’s another true story. Remember, I was the CMO of a health plan. I really took this Patient Safety Movement to heart, since, as a physician, this sentence was pounded into our brains, “First, do no harm.” It’s part of the Hippocratic Oath we all took. I started looking at whether a health plan and its processes could create a patient safety event. A case occurred that required a “root cause analysis” that confirmed my suspicion. Here’s a synopsis of that event. A Medicaid member of our Medicaid Health Plan was admitted to a hospital with a ruptured appendix. She was a minor. She had the surgery and post-op was put on two antibiotics since ruptured appendices can cause an abdominal infection. The patient was discharged on the two antibiotics. One of them was not on the health plan formulary, so it required a “prior-authorization”. Error #1 – The hospital surgeon didn’t know which antibiotics were on the formulary (health plan based error). The big problem was, the Medicaid member had been re-admitted to the hospital with an abdominal infection at 9:00 AM Tuesday morning, five hours before the authorization request was sent to the health plan. The root cause found by the quality staff was: the need for a prior –authorization for a critical medication for a patient being discharged from the hospital. We changed our policy to: anyone with a prescription coming from a hospital (inpatient, ER or Urgent Care) would have that prescription filled regardless of whether it needed a prior-authorization or not. Meanwhile we worked on figuring out how to make sure discharging physicians would be able to know whether a drug was on the formulary or not. 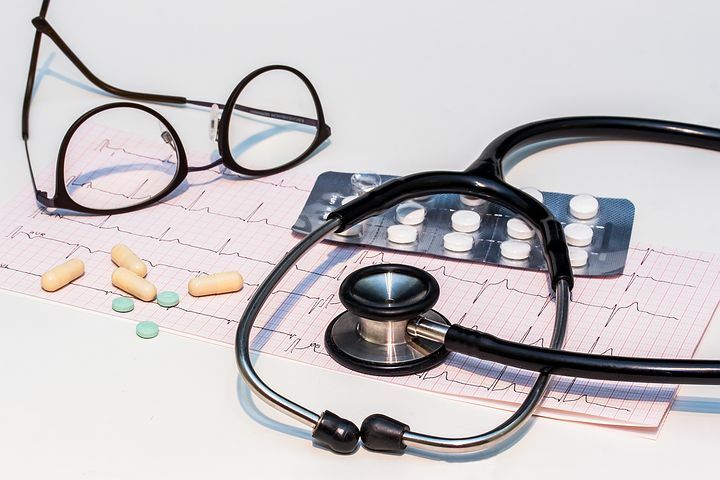 Believe it or not, to this day, even with an Electronic Medical Record and a national system like Surescripts, knowing what is on a health plan’s formulary is very problematic. Here’s the kicker. I wrote up a proposal to start up a health plan based Patient Safety Committee that not only looked at patient safety cases from the delivery systems, but that also looked at and tried to mitigate health plan patient safety events. That had to go to the Board of Directors. They couldn’t understand how a health plan could cause patient safety events. I had to go back to the Board meeting two more times with case reviews like the above to convince them that we should have a Patient Safety Committee and that a health plan could cause patient safety events. As I went to conferences after this and talked about our Patient Safety Committee and that we were looking at cases where the health plan policies and actions caused adverse patient safety events, none of the other health plans would agree to or admit that a health plan could cause patient safety events. To them it was a delivery system problem, and the role of the health plan was to hold them accountable. My ideas were rejected by the medical community. To this day I don’t know of any other health plan that looks at or thinks they have an active hand in causing patient safety events and I’m pretty sure the health plan in the above story has abandoned their committee (I left there 8 years ago). Anyway, if you noticed, it always takes an outside force to get the medical community to do something. First, Medicare, and then, the Patient Safety Movement in this story. Employers got in the act and created Leapfrog, which rates hospitals on safety, but, it’s voluntary and not all hospitals participate. Leapfrog gives non-participating hospitals a failing grade. So, you’re getting some idea why Quality is #4. More to come. In 1990, James Reason proposed a relatively simplistic model for understanding errors and defenses against errors resulting in defects. Definitions: Errors = something went wrong. Defects = errors have an impact on the customer, in our case, the patient. So, an error can be a mistake or mishap that is blocked by a “defense mechanism” so that the customer/patient never feels any impact (the defect). If the error in a process is blocked near the customer/patient it is called a “near miss”. Example: A patient is in a same day surgery center and requires a medication. A nurse hands the doctor a syringe full of the medication. The doctor asks a verifying question about the dose amount. The nurse double checks the medication vial and says, “Oops, the syringe has 10 times the requested dose” and takes back the syringe. This is a blocked error (wrong dose) and a near miss (since the next step in the process would have been injecting the medication into the patient which would have caused a defect). James Reason’s model assumes that every step in a process has inherent errors and is like a slice of Swiss cheese. The first trick is to have as few holes and the smallest holes in the cheese as possible. As the process steps line up, each step/slice of cheese has holes, but the next trick is to have none of the holes line up, so each step “blocks” the previous step’s “holes” (errors). Problems occur when holes line up in the slices of cheese creating an “error conduit” allowing an error effect to pass through the holes resulting in a defect event impacting the customer/patient. Often this defect event has catastrophic consequences. If you Google “Swiss Cheese Model” you will be able to see Reason’s drawings of the model. In the example above, the holes might be: There is no training regarding call-back between nurse and doctor (where the doctor says “ten milligrams valium IV”, the nurse says “ten milligrams Valium IV”), maybe the bottle of Valium delivered by the pharmacy is 100mg per cc instead of 10mg per cc, the nurse didn’t read the bottle for concentration amount, etc. You get the point. All of these errors added up to the nurse giving the doctor a syringe with ten times the requested dose. If the doctor just took the syringe and injected it, the patient would have had a respiratory arrest. A catastrophic event. Well, it turns out, health care processes have a lot of holes in the Swiss cheese and it isn’t uncommon for the holes to line up. But, you don’t have to take my word for it. Here is an excerpt from a study of Medicare beneficiaries. An “adverse event” is a “defect”. “An estimated 13.5 percent of hospitalized Medicare beneficiaries experienced adverse events during their hospital stays. Of the nearly 1 million Medicare beneficiaries discharged from hospitals in October 2008, about 1 in 7 experienced an adverse event that met at least 1 of our criteria (13.5 percent). This rate projects to an estimated 134,000 Medicare beneficiaries experiencing at least 1 adverse event in hospitals during the 1-month study period. We calculated incidence rates for adverse events that met our three criteria: 0.6 percent of beneficiaries had an NQF Serious Reportable Event, 1.0 percent had a Medicare HAC event, and 13.1 percent experienced an adverse event resulting in the four most serious categories of patient harm. An estimated 1.5 percent of Medicare beneficiaries experienced an event that contributed to their deaths, which projects to 15,000 patients in a single month. An additional 13.5 percent of Medicare beneficiaries experienced events during their hospital stays that resulted in temporary harm. Temporary harm events are those that require intervention but do not cause lasting harm. Although many cases represent fairly minor occurrences, such as hypoglycemia, others were classified as temporary harm only because the patients were in the hospital for lengthy periods as a result of other, more serious, diagnoses, allowing hospitals enough time to address the harm prior to discharge. Additionally, 28 percent of beneficiaries who experienced adverse events also had temporary harm events during the same stay. One thing is, the VAST majority of studies on medical adverse events is in hospitals, which are relatively controlled environments. Some experts estimate that outpatient adverse events are at least 20 times higher than hospital events, but, up to the date of this post, I don’t know of any well-designed study that quantifies outpatient adverse events. I proposed doing this when I was a Medical Director of a large integrated delivery system (IDS) (Hospitals, Ancillaries, Health Plan and Physician Group) and they wouldn’t fund or allow the activity. We could have done it because we had huge amounts of outpatient data, including non-IDS-physician group providers and pharmacies. We could have made a positive impact with the information. The main problems with getting the activity funded were: 1. Since the prevalence and types of adverse events weren’t known, a financial return on investment (ROI) estimate couldn’t be made (remember, it’s all about the money) and, 2. Fixing things would have meant applying the IDS’s resources to address things outside of the “four walls” of the IDS, i.e., it would cost the IDS money to improve these non-IDS systems. This was tantamount to heresy by the Finance Department, I mean, spend the IDS money on non-IDS providers and processes that would result in better and safer patient care? Yeah, right, that would never happen. So, here are three personal examples of outpatient errors. They didn’t result in a defect only because of my and my wife’s persistence. These are the stories of three consecutive prescription refill requests. I’m convinced that, if a person not as knowledgeable in health care systems as I am had these experiences, these would have been adverse events. So, here’s an example of how a “next-generation” medical office system works. The issues were shared between the pharmacy and the physician office, but predominantly there were physician office systems errors. My primary care physician (PCP) of 16 years is in a 650 “provider” (Physicians, Advance Practice Clinicians, Pharmacist Clinicians) multispecialty group. In August 2016, I had a periodic health check-up. My primary care told me he was moving to a government corporate position in October and I should call on October first and get a new PCP. On October 1, I called the customer service department. They had no knowledge of the PCP leaving the medical group. I asked how they determine how the PCPs patients are re-distributed. They don’t know. I ask if there is any system or process involved that tries to match a patient’s conditions with an appropriate provider and… they don’t know. They tell me I’ll get a letter in the mail about it, but they don’t know when. I had to file a complaint to get the information about the available PCPs, their training, and any areas of clinical interest or enhanced training, etc. I agreed on a PCP at the same clinic. Since I had just had my annual check up, there was no need for an appointment. I moved from one side of town to the other side of town. Now my new PCP was about 12 miles away. The medical group opened a new clinic 3 miles from my new home. I called to transfer to the new site. I got a call from the medical group explaining that the new site was a new model, you weren’t signing up for a PCP, but a primary care site that was manned by one physician and five Advanced Practice Clinicians. I said that was OK with me as I supported that model. I also had transferred all of my prescriptions to a new pharmacy (same chain) near my home. March 12: Submitted refill request online. March 13, 9:00 AM: I get a text message from the Pharmacy saying my prescription was delayed. The message said click on the link to see details. I clicked on the link and it brought me to a page that said, in order for me to see my prescription status, input your birthdate into the field below. I used their calendar function to input my birthdate. The birthdate showed up but it was grayed out and when I clicked “continue”, it reverted to an empty field and said it was a required field and I hadn’t filled it out. I tried to input the date 3 more times, got the same cycle back to an empty field with the same message and finally gave up on it. March 13, 11:11 AM: I call the pharmacy asking what is the cause of the delay. The answer was, I have no more refills, that the reason I only got 60 the last time was there were no refills on the prescription the last time I requested a refill. This seemed odd as the process should have been requesting the refills from the PCP at that time and I should have gotten 90. [ERROR #1, not following standard process] – A prescription with no refills was refilled instead of the pharmacy requesting refills from the PCP. [ERROR #2, not following standard process] – The pharmacy never notified me that there were no refills. Then they tell me they sent the refill request to the old PCPs office for the refill request. However, my new PCP is not in that practice since I moved to the new site. They suggest I call the old PCP office to make sure it would be refilled, since I wasn’t technically their patient anymore. March 13, 11:18 AM: I call my old PCP office. The woman there tells me the prescription refill should come from the providers at my new site. She takes down all of the information and says she is sending a note to the new site to have it renewed. March 13, 11:37 AM: I get a voicemail call from my new PCP site saying the prescription was renewed on March 1 at my old pharmacy 15 miles away and I should call my new pharmacy and have the refill transferred to my new pharmacy. March 13, 11:44 AM: I call my new pharmacy and tell them what the last caller told me. The woman there searched their system and said there were no active requests for this medication for me in their system. I started thinking, the March 1 date may have been incorrect and the last caller may have misstated the date. Maybe my old PCP site had sent it in and now there was also a request from the new site and there could be two requests going in at the same time. March 13, 12:31 PM: I call back the old PCP site and voice my concerns that there could be two requests, and I request that they make my new pharmacy the default pharmacy in their Electronic Medical Record. The woman there said the default pharmacy was changed previously but there is no evidence of a prescription being sent in. March 13, 1:05 PM: I call my new PCP site and inform them that there apparently is no refill request issued by them, because they think there was one called in on March 1, and my old PCP’s site hadn’t sent one in. I told the woman there that there was no evidence of a request in the pharmacy’s system, either. She said she would go over all of the info in the Electronic Medical Record (EMR) and put me on hold. She came back on and said she would get back to me. March 13, 3:29 PM: I get a call back from a different woman from my new PCP site who tells me they misread the EMR and the March 1 refill was one year old, in 2016! [ERROR #3, inattention] – Misreading the EMR led to a potential gap in my having my medication (a “near miss” because of my persistence). She tells me that my new PCP may not refill the prescription because she has never seen me, that she would ask the “provider of the day” to renew it if the PCP wouldn’t but if he also declined, they would send the request to the old PCP’s site because they should be responsible for renewals until I can be seen by the new PCP. This is the exact opposite from what the first woman told me at my old PCP’s site. Also, this didn’t make sense because no provider at either site has seen me and they both have the same medical record to refer to since they are in the same group. [ERROR #4, lack of standardization or lack of adequate training] – Inconsistent staff information led to delay and bouncing accountability back and forth within the same medical group. [ERROR #5, lack of standardization] – A provider in the same medical group, seemingly the same medical practice, being unwilling to refill a continuous medication because they had never seen that person, but was willing to defer that to another provider who had never seen me and would never see me. March 13, 3:47 PM: I get a call back from the new PCP office. The woman tells me that the new PCP will refill the prescription but wouldn’t approve any more refills until I was seen. I asked for an appointment and she gave me an appointment for 6 weeks hence. Does anyone think this is patient friendly? I had a medication that needed to be refilled. With Big W Pharmacy, you can create an account and manage your medications online and with a smartphone app. So, I went online on my computer, signed in and went to the “Refill Prescriptions” page in the dropdown menu. In the Refill Prescription page, all of your prescribed medications are listed. You can click on a button that activates automatic refill if you want. My medication is one that runs out variably so I didn’t activate that function for this particular medication. To the right of the auto-refill button is a check box that you check to refill a prescription. I checked the box next to the medication I wanted refilled. There is a button at the lower right that says “Request Refill”. I click on that button and I get a page that says my medication refill request is sent to my Big W Pharmacy, including the pharmacy’s address and telephone number. Now I wait. The process should be, the request is sent to my pharmacy and the pharmacy either refills the prescription or, if all of the refills have been used, the pharmacy faxes a refill request to the doctor’s office. The doctor’s office is expected to review the faxes daily and send a doctor’s decision (refill or not refill) back to the pharmacy. If the doctor orders a refill, the pharmacy notifies the patient one of three ways: 1. A robo-phone call, 2. An email, 3. A text message. Seven days later, I’m suspicious that something went wrong. I went into the online account and clicked on “Prescription status”. It’s an empty page. I called the doctor office, they hadn’t gotten a fax from the pharmacy. I called the pharmacy. They said they never got a notification from the online system. [Error #1, IT system malfunction] The woman who answered the phone said , “This happens all the time.” I asked, “Who do I talk to, to file a complaint?” She said I have to call corporate, the local pharmacies have nothing to do with the IT stuff. The woman entered my refill request into the system for me and said they would send a fax to the doctor’s office. I called the corporate office and filed a complaint. They told me they would call me within 48 hours to tell me why the system didn’t work. I called the Big W Pharmacy’s corporate office again and filed another complaint. I get the same answer that someone will call me within 48 hours with what went wrong, but, I should use the online or smartphone app as they will be accurate. I told the person on the phone that I didn’t believe that those would be accurate since nothing I’ve used so far had been accurate. I called the doctor’s office and got a voice mail. I left a message saying that Big W Pharmacy’s system has been problematic in getting a refill request to them and could they check their fax pile and see if something has come in. The voice mail says I will hear from them within 24 hours. 30 hours later, I’d heard nothing from either the pharmacy or the doctor’s office. [Error #3 Physician Office process delay] My wife checked the prescription status and it said Big W Pharmacy had sent the request twice to the doctor’s office. I’ve never gotten a call from Big W Pharmacy IT people. My health plan has a contract with RxMO Pharmacy for mail order prescriptions. I had a visit with my Primary Care Physician (PCP) and asked her to send a prescription for a 90 day supply to the mail order pharmacy after I notified her through the patient portal that I was registered for mail order (I had never gotten mail order medications before). I went to the health plan website and looked up how to get mail order prescriptions. What they had was a brochure .pdf from RxMO Pharmacy. The brochure had thee options: 1. Online registration, 2. Telephonic registration, and, 3. Paper registration through snail mail. I chose the online method. I called the number and got a nice woman who looked in the system and said that the only two fields that had “taken” were my name and date of birth. I had to go through all of the fields again with her verbally. I also arranged for payment to be made by credit card. She said that all that needed to be done now was for my PCP to send them the prescription and they would process it, send it and charge my credit card. She said I would get a call within two days of their getting the prescription from my PCP notifying me when the package would arrive. I messaged my PCP to send the prescription. Two days later I got a message from the PCP office that they had sent in the prescription. The next day, my phone rang with an 866 number. When I answered it, it was a robo-call fromRxMO Pharmacy. It said before they could send me the prescription they needed to verify that I was the person they should be sending it to. They asked me to input my date of birth. While I was doing that, my phone double struck one of the numbers and my phone doesn’t have a delete function for this, so, now I was stuck with a wrong date of birth. The robo-caller finally said it couldn’t understand my date of birth and it was transferring me to a live person. The phone rang twice and I got another robo-caller asking for my date of birth. I put it in correctly. Then it asked for my zip code. I put that in correctly. Then it asked for my phone number. I put that in correctly. Then it asked for my prescription number, also saying if I didn’t have the bottle with me, it would hold until I found the bottle. A woman came on the phone and asked me the same questions the robo-caller did. [Error #5, Over processing] Then she said she had my account pulled up, why was I calling? I told her the above story, also adding that there should have been an opt out of the robo-caller (like, dial 0 at anytime to get to a live person) and asking me for a prescription number was really stupid for a first time prescription (yes, I used the term stupid!) and they should have had another opt out command, like, “if you don’t have a prescription number dial 0”. She said, “I’m sorry, I can’t help you with filling a prescription. I’m going to live transfer you to the correct person” and put me on hold. I was on hold for almost 10 minutes. [Error #6, Delay on processing] The customer service rep came back on three times telling me she was still trying to transfer me. Finally, she said she had the person on the line and was now transferring me. So, I told her my story (again). [Error #7, Over-processing] She said she was the right person but didn’t know before I told her the story because the person who transferred me to her didn’t say why the transfer was occurring. [Error #8, inaccurate communication] She pulled up my account, verified the medication and asked if I wanted them to send me the drug (REALLY?!?). I said, yes. She verified the address and told me the medication would be arriving in eight days. You can see how these errors can line up like holes in Swiss cheese and result in a defect impacting a person. Luckily, my medications weren’t “life-saving” and I knew how to work the system. Not true for most people. And it could have been catastrophic for people on medications treating their cardiac disease or diabetes where their life is at stake. Read my Clinical Quality Part 1 post dated April 29, 2017 to see a more serious consequence of Pharmacy/Health Plan/Physician Office processes creating a serious adverse event. And these examples are only relating to getting a medication! This has to be what the majority of patients go through on a daily basis. I can’t imagine that these stories are specific only to me. And this is only the tip of the iceberg. There are studies of patients who get re-admitted within 30 days of a hospital discharge that show that process issues like the above related to multiple health care service providers (doctors not responding, durable medical equipment companies not showing up, pharmacies’ processes causing delays or not filling prescriptions correctly, home health agencies arriving 3-5 days late, etc.) are significant contributing factors for those 30-day re-admissions, which are adverse events. There are similar error prone experiences that patients are going through related to other health care systems. Tests that don’t get reported, test results that are never reviewed (cases like an imaging study shows a cancer but is never reviewed, the physician office policy is “if you don’t hear from us everything is normal” and 6-12 months later, the patient comes in for a re-check and now has an untreatable cancer…this actually happened…), etc. Here’s another scarier true story. I’m seeing same day patients at a primary care site. It’s Thursday afternoon. I see an elderly woman being treated for a cancer, undergoing chemotherapy. She presented to the ER four days earlier with fever and a bad sore throat with swelling on the left side of her face and neck. They do a bunch of tests. Her white blood cell count is low due to the chemotherapy. As a matter of fact, she says her chemo was delayed because her counts were so low. They do a CT scan of the face and neck. It shows a 0.5 cm stone obstructing the salivary gland duct and the salivary gland is very swollen. There is no mention of this in the ER physician’s notes. They give her a prescription for amoxicillin and advise her to follow-up with her PCP if she is not better, and the final diagnosis is pharyngitis. Now, I have to assume they missed the salivary duct stone reported on the CT scan report. FYI, you can’t clear a salivary gland infection caused by a stone stuck in the duct without removing the stone. And, this patient was significantly immunocompromised and could have gone into full sepsis with the degree of leukopenia (low white blood cell count) she had. I call our medical group’s Ear, Nose and Throat (ENT) department, giving them the story and requesting an immediate appointment to have the stone removed before the patient became septic. They said they couldn’t see her until the next Tuesday. I told them this was unacceptable, she needed the procedure ASAP. They said, send her to the ER. Since that was where she had been and that hadn’t gone well, I wanted the specialist who could treat her to see her. They said sorry, Tuesday was the best they could do. I hung up and called a non-medical group ENT, a physician in solo private practice. He advised me to change her antibiotics to cover more bugs, and he would see her first thing in the morning. She made it through the night and had her procedure in the morning and did fine, no thanks to the health care system she was in. I bet you can relate a similar story. Most people can, either for themselves or someone they know. Sad! But true! Now, the thing is, there are ways to make these systems more reliable and they are used by industries like the aviation and nuclear reactor industries. They are also used by companies like Toyota and Hyundai. These “ways” to make systems and processes more reliable and reduce errors and defects have been tried by some health care systems but most abandon them, spending their money on things like building new shiny buildings. They like spending money on tangible things that you can touch rather than improving care processes that actually benefit the patient by improving outcomes or creating a safer environment. So, what should be the number one priority for a health care organization or person? Do I really have to ask? It should be YOU, the patient!! Of course! If it were you that was the number one priority in health care, what would that look like? I can tell you, it would be a lot different than it is now. How? There would be a relentless focus on creating the most reliable, error-free and efficient health care processes (the processes you are in related to your health status) as humanly and technologically possible. It isn’t that way now. In a chemical engineering company, if there is an explosion because two gases or liquids are accidentally mixed together, it’s the workers who get killed or maimed. In the airline industry, if the plane goes down, the pilots and flight attendants are killed and harmed along with the passengers. In the construction industry, if there is a construction accident, it’s the workers who are killed or maimed. In the coal mining industry, if there is a mine explosion or collapse, it’s the miners who get killed or maimed. In health care, it would be seconds, not days between defects harming patients. These are called Adverse Events. The main reason being, 99% of the time, it is the patient who is killed or injured/harmed, not the worker. The staff has no personal “skin in the game”. You are likely to be much more diligent to prevent a harm event if you are at risk of being killed or harmed. Now, there are some instances where health care staff are personally at risk. It is usually related to getting an infectious disease, like HIV. In these cases, there are some pretty good risk avoidance devices and attempts at procedures, like Universal Precautions (gown and glove before doing certain things) and IV catheters and syringes that have been engineered to prevent a staffer from sticking themselves with a needle. The patient is the one who loses their good leg when a surgeon cuts off the wrong leg. The patient is the one who is harmed when a sponge or instrument is left in their body during a surgery. The patient is the one who is harmed when a patient doesn’t get what they need or they are misdiagnosed or their test diagnosing a lethal disease gets lost. In all of the above, the worker is unaffected. Remember the story in my post about Patient Safety? The child died. The staff lived and were unharmed. In my experience, while trying to get health care systems to be relentless about how they actually deliver the care, this is what gets in the way. The worker isn’t harmed. Remember the COO of a system saying he didn’t think anything had to be done urgently to address patient safety because the errors had been going on for a long time? He wasn’t the one affected by adverse events. I’m betting you wouldn’t have said something like that, since you’re the one who would get killed or harmed. The funny (or sad?) thing is, you only need a few mortal (or not even mortal) events in other industries to get the whole nation up in arms about a company (not even the whole industry). Remember when Ford Explorers were rolling over, with people killed? How about the Takata airbags (they are going bankrupt, I read)? How about Chipotle and the diarrhea (they haven’t recovered from that yet)? The Chevy Cruze ignition switch problem killing some people? Remember the national outrage about those? Chevy had to stop selling Cruze’s until they fixed the ignition switches. That’s 575 people A DAY!! A Southwest Airlines 737 jetliner holds 143 people. That 273 people dying a day is the equivalent of four 737’s crashing a day. (Who thinks Southwest Airlines would still be in business if four of their 737’s crashed per day?) With no significant reduction in 15 years! And that’s only DEATHS in the hospitals. According to an article in the September 18, 2013 in BMJ Quality & Safety, 43 million people are injured worldwide each year due to unsafe medical care!!! That means 49% of hospital admissions have an adverse event. And it’s not piquing anyone in the US or in heath care’s sensibilities. Conclusion: The fact that it is the patient and not the worker who is at risk for the vast majority of deaths and harms in health care from errors and defects is a hindrance to creating reliable, error-free health care processes. The worker is one step away, not at risk. Sensitivity to operations. Preserving constant awareness by leaders and staff of the state of the systems and processes that affect patient care. This awareness is key to noting risks and preventing them. Reluctance to simplify. Simple processes are good, but simplistic explanations for why things work or fail are risky. Avoiding overly simple explanations of failure (unqualified staff, inadequate training, communication failure, etc.) is essential in order to understand the true reasons patients are placed at risk. Preoccupation with failure. When near-misses occur, these are viewed as evidence of systems that should be improved to reduce potential harm to patients. Rather than viewing near-misses as proof that the system has effective safeguards, they are viewed as symptomatic of areas in need of more attention. Deference to expertise. If leaders and supervisors are not willing to listen and respond to the insights of staff who know how processes really work and the risks patients really face, you will not have a culture in which high reliability is possible. None of the above bullet points have anything to do with tools (like The Improvement Model, FOCU-PDCA, Lean Six Sigma). They all relate to what should be in the hearts and minds of health care leaders, managers and staff. Unfortunately, in health care, these things are not. The “corporate” leaders are preoccupied with Profit and Growth, the managers are executing tasks, the line staff are executing tasks, the providers are looking at individual patient issues, patient by patient (myopic view of the system). I actually presented a synopsis of this AHRQ treatise to the board of a large physician group, hoping to gain some motivation from the group to start a cultural shift toward reliabilty. The comments from the meeting evaluation went something like this,” I don’t know how this pertains to me”. Enough said. It turns out, even if you, as an individual, have the predispositions listed by AHRQ above, they are quickly suppressed by the leaders, managers, and the systems in health care. You generally “give up” as no one listens; no one in authority is willing to change their paradigm. You get worn down. You have no idea how many times I’ve heard that from conscientious staff and providers who decide they just don’t have the energy anymore to fight the resistance from “the higher ups” and they fall back in line with the culture of “it is what it is”, their hopes dashed. Back to “it’s just a job”. This is different from a company like Toyota. Sakichi Toyoda was the founder of what we know as the Toyota automobile company. Sakichi actually started with loom weaving. He also came up with two basic Lean concepts: The 5 Why’s and “Pulling the Andon cord”. Sakichi essentially created the Toyota culture. The story goes, Sakichi had a building filled with looms on which women wove cloth. At times, a loom would mis-thread the fabric. The weaver would weave for a while without stopping and notice the mis-thread when that section was completed . She would take the fabric with the defects and throw it in piles outside the back door of the building. Sakichi noticed this and clearly saw this as waste, which was costing him money (which related to: he had to charge more per piece of fabric to make up for the waste). He got all of the weavers together and told them to watch for the mis-threading and as soon as they noticed the issue they should stop work and call for help. Then someone would help figure out what made the loom mis-thread and fix the loom. Stopping and asking for help is called Pulling the Andon cord; the 5 Why’s are used to figure out what is the root cause of the problem. That was over 100 years ago. Reliability and minimizing waste is an inextricable part of the Toyota culture that has been there from the start. The Toyota company is one of the lowest defect companies in the world. They created Lean, which is a sophisticated defect reduction, efficiency improvement system. The reliability mentality is absent or minimal in almost all health care systems. There are a few institutions that get close. Virginia Mason in Seattle seems to have taken Lean to heart. Intermountain Health Care in Salt Lake City UT has been using The Improvement Model for 30 years. Most health care organizations haven’t shown that they can sustain that type of improvement culture for that long. Geisinger Health Care is another that actually warrantees some surgeries. Most of their efforts are hospital based. Unfortunately, the above organizations are outliers. And once you get out of organized systems like the above, reliability thinking basically falls off like a cliff. The systems in the ambulatory care environment are woefully unreliable. A recent article in JAMA Surgery is telling in its title – Safety for the Surgical Patient—What Will “Move the Needle”? ; JAMA Surgery July 2017 Volume 152, Number 7. They are admitting that nothing has changed in the surgery arena since the Patient Safety movement began in 1998. The management systems in health care can’t integrate and sustain tried and true reliability systems, strategies and tactics. This is the main reason health care systems can’t sustain process improvements intended to increase reliability in health care processes. The management system is not aligned with and the managers are not (and often can’t be) trained in process management. The management system is task oriented, the managers come from task oriented environments and jobs/positions, and task completion is valued by health care systems. Not so much for process management. Senior Leadership doesn’t understand and isn’t completely bought into what it takes to create and sustain changes that support reliability. They generally don’t put the time and attention into making things happen and holding the accountable managers accountable. They are used to something more tangible, like, re-contracting for a better price for knee replacement implants. They can see an immediate savings/ROI with that. With projects like Lean or Six Sigma projects, the improvements in reliability and quality are much less tangible and the lead-time for ROI is often 12-24 months. Sometimes, there is no financial ROI, the positive outcome is less morbidity and/or mortality. Health Care Leaders usually have zero process improvement experience or training. Their answer usually is , “We have committees for those things”. And they never attend those. So, process improvement becomes just something going on in the organization that “those clinical and quality folks do.” Senior leaders pretty much give lip service to quality improvement. They like it, but to them, they should “just know it’s going on”. They like to brag about it at conferences. That’s about it. Rule #1: If Senior Leadership is not 110% invested in process improvement, very little process improvement will occur, be successful, or be sustained. Here’s an example of how leaders “support” process improvements in health care. I’m a Medical Director at a hospital. I’m a Lean Six Sigma Green Belt helping a nurse manager get her Lean Six Sigma Green Belt. There is an issue at the hospital related to Code Blue’s and “Pre-code Blues” (when a staff person or family member notices a patient looks bad but hasn’t coded). There are too many. The hospital has a “Rapid Response Team” (another waste of money) but they haven’t tracked any KPI’s (Key Performance Indicators) to say they are at all effective. We used the nurse manager’s floor for the “Beta” project. The nurse manager identified a team, which included a person from every job position on the floor and a hospitalist physician. We met every Wednesday at lunch time in their staff room for six months. The main assessment findings were, there was no standardization of anything related to “periodically assessing patients” including when to escalate. No standard forms, no standard process, no standard communication, no standard “triggers” (when to call the charge nurse or Rapid Response Team), no standard time sequences. Nothing standardized. Each staff person did what they did according to the way they wanted. The team standardized everything. New standard forms for documenting vital signs. Clear triggers for Nurse Techs to call nurses and within a specified time box. Etc. The KPI for the project was unexpected transfers to the ICU for worsening clinical condition. These fell 43% and sustained there for a full year while I monitored the process. Now, I had to calculate an ROI, because, if I couldn’t get a positive ROI, we couldn’t implement these changes in any other hospital floor. That was what the leadership valued over everything else, an ROI. I had to partner with a finance manager to calculate the ROI (Oops, here comes trouble!) When we did the ROI, for one year for one hospital floor, the project saved $750,000 in avoided ICU costs, including shorter lengths of stay in the hospital since the patients in the 43% didn’t spend any extra days in an ICU. I thought, “This is great!” But, not so fast. The finance manager said,” Wait, look at this line item here on the financial analysis.” She pointed to a negative $50,000. I said, “What’s that?” She said, “That’s the impact to the hospital’s bottom line. (Recall the Studer paragraph and bottom line.) That’s the ROI to the hospital. It turned out, the ICU days the transferred patients were using, when they had to get transferred there, had a higher contribution margin (the net a hospital makes) than a regular floor bed. For the hospital, the project reduced their revenue, hence the negative number. Me being a person who doesn’t quit, I started thinking about it. What came to mind was, if we weren’t transferring patients to the ICU, then the ICU has more capacity (my Lean Six Sigma mind kicked in). I had calculated the “number of ICU days avoided” as part of my dashboard. I went to the Bed Management (the department that accepts transfers from smaller hospitals and doctor offices) director and asked what the demand was for external ICU admissions and how many did we decline in the last 12 months. He told me they declined 1200! That demand was way higher than the capacity we generated, so, I could count every avoided ICU transfer day in a revised financial analysis. And, on top of that, a transfer to the ICU from outside the hospital had a higher contribution margin than a transfer from the floors. I met with the Finance manager again and had her include this in the calculations. It came out to a positive $250,000! We spent the next year spreading the standard work. But you can see what’s important to the leadership. Not your health status. And not really the reliability of the process, just the money saved. The health care management systems and their upper managers do not know how and won’t accept doing what it really takes to implement and sustain a process improvement. Health care leaders think you do a project for, say, three months, re-design a process, do a show and tell at the completion of the project and hand off the newly designed process to the manager of the department and move on to the next area. They think that the manager and staff can execute the tasks in the new process flawlessly at that point in time. Spending more time on that is a waste of time. (As a matter of fact, some senior leaders think the team process for creating the new improved clinical or business process is wasteful. I’ve actually been at meetings where the senior leaders bemoan the fact that the staff and managers are spending part of their “paid time” “sitting in a conference room”. They think that is so wasteful they calculate the cost of the staff’s salaries spent in improvement activities and call it a waste of money. They don’t get the fact that the people doing the work usually come up with the best ideas of how to fix the processes. They’d rather pay a consultant to come in and just tell the staff what to do (just give them the tasks)). In true process improvement cultures, they understand that, for up to six months after a significant process improvement, the managers of the work floor should spend 50-75% of their time on the work floor auditing what the staff are doing and encouraging them to keep doing what was implemented during the project. This “habituates” the staff to the new way. If you don’t do this, the staff (and the manager) regress back to the “old way”. In the Toyota Production System, this is called “standing in the Ohno circle”. The other thing is, managing a process is very different than monitoring task completion. There is always a “dashboard” of Key Performance Indicators (KPI) that have to be measured and monitored by the manager. If a KPI performance degrades below a pre-set value, the manager is supposed to take action to get the KPI back to expected performance levels. Health care managers: a. don’t prioritize the measurement system as being important, b. are distracted from monitoring or measuring because they are already overwhelmed with tasks (often meaningless, legacy tasks), which are the things they get evaluated on for raises, and c. are not adequately trained in the skills and tactics necessary to create an action plan to “revive” a degrading KPI. Rule #2: Before embarking on process reliability improvements, make sure you have either adequately trained managers to process manage or have sufficient resources to assist managers in process management until they are proficient at it. Rule #3: Assess and remove no or low value tasks from managers who are now accountable for process improvement and process management. Here’s an example of how this currently plays out in health care. I was a Medical Director of a hospital. Several years before, the Endocrinologists decided they didn’t want to be on call or take care of inpatients (See “Why Physicians Prefer Doing Shift Work”). They changed their hospital privileges to Consulting only. Probably the most critical, emergent, serious condition in all of Endocrinology is Diabetic Ketoacidosis (DKA). The Endocrinologists had delegated care of DKA to the Intensivists (These are physicians who only take care of patients in Intensive Care Units minus Cardiac Care (the Cardiologists do that)). It’s like a Cardiologist delegating heart attacks to non-Cardiologists. I could never figure that out, why Endo’s would want to do that, but, it’s got to be “lifestyle rules, man!”. I actually had an Endocrinologist tell me he was happy that he didn’t get awakened in the middle of the night anymore with reports on blood sugar, potassium and bicarbonate readings. I seriously don’t get it. I have to stop the story here to give you a little insight on how a lot of Specialists think. As a Primary Care Physician, I saw this a lot and had to challenge Specialists about the following phenomenon. Now, Specialists are really smart people. At the same time, they are only generally knowledgeable about the little stripe of Medicine in which they were trained. And they read their specialty journals, which can have very early experimental articles in them. Some of the articles are about experiments on animals. The Specialists reading these articles will, in their minds, extrapolate from these very early experiments to their (and often my) patients (you) without a Phase I, II, or III clinical trial. I actually had a Neurologist tell me what a goal blood sugar should be in a stroke patient because she read an article about the level of glucose in rats’ spinal fluid compared to their blood sugar. Really, a rat! OK, so, thinking within that context, the standard of care for DKA is IV fluids, careful attention to blood sugar and blood electrolytes and an IV insulin drip. It’s been the standard of care for decades. The insulin drip allows you to adjust the dose of insulin commensurate with the blood sugar level and degree of acidosis (amount of acid in the blood). The Intensivists had decided to use a long acting sub-cutaneous insulin, like insulin glargine instead of an IV insulin drip. The package insert, Pharmaceutical company monograph and even the TV ads for the long acting insulin clearly stated “Not to be used in Diabetic Ketoacidosis”. The Intensivists basically said they could ignore this recommendation because, theoretically (the operative word), since the long acting insulin created a steady, linear amount of insulin in the blood of ambulatory diabetics, just like the IV drip does in the hospital, they could use it in DKA, it was the same thing. ……Theoretically. See, they were extrapolating from an ambulatory environment with a stable patient to an inpatient environment with a critically ill patient. Well, I had to actually do a lot of Columbo work to track down the actual research that leads all long acting insulin Pharmaceutical companies to clearly state that no one should use their long acting insulin in DKA (they all say that, even the new ones like Tresiba). It turns out, a very well respected physician researcher at an academic institution started a study to see if long acting insulin (the exact one the Intensivists were using, too) could be used to treat DKA. But, I couldn’t find an article published on his findings. So, I emailed him and asked him where the article was published. His answer was, there is no article. They had to stop the study early because too many study patients experienced severe hypoglycemia (low blood sugar). They deemed long acting insulin inappropriate for treatment of DKA. So, with this information in hand, I had to get the Vice President of Medical Affairs to tell the Intensivists to stop using the long acting insulin and use the standard of care: IV insulin. Really, they wouldn’t stop just based on the evidence. But, now, we had to re-create a reliable process and a set of tools to make sure the DKA patients got the standard of care, since the process had deteriorated due to the physicians deviating from it for some time. We did a Lean Six Sigma project and installed the new process. For three months, I personally went to the ICU and did a chart extraction audit on every single DKA admission to the hospital. This created a score and documented any process errors that could be addressed the next day. Not that there were that many DKA admissions, about 5 a week maximum. The audit was a one sheet form with the critical steps of the process in the left column, a check mark column in the middle and a comments column on the right. Each patient took less than 10 minutes to audit. The Electronic Medical Record was incapable of doing this kind of audit, so the auditing couldn’t be automated. The project was a success. Shorter length of stay, less hypoglycemia, etc. The project was handed off to the nurse manager of the ICU. Within a week, there were DKA patients who didn’t get an audit. I met several times with the nurse manager who bemoaned the fact that she had (guess what?) a lot of other tasks to do and it was hard to get to these medical record audits. (Ten minutes 3-5 times a week!). So, I went to the Quality Department where they had nurses called Clinical Project Coordinators (CPC), a part of whose job is to do medical record audits. I asked if they could do the audits to “relieve” the ICU nurse manager. They said they were too busy. I reported this to senior leaders. They were unwilling to order the managers in the ICU or Quality Management CPC’s to do the audits. Who knows which patient is getting what or when now. See what I mean? No desire, no accountability, not made accountable. The current health care management system doesn’t value process management. Quality Management Staff and Leadership must be nurses. This is another sacred cow in health care. In every health care organization I have been in when I get there, all of the positions in the Quality Management department have “Nurse required” in their job descriptions. Now, I love nurses. They were my eyes and ears and even part of my brain when I was practicing. I have the utmost respect for nurses. At the same time, the nursing profession self selects a certain type of person. A task oriented person. It’s just how it is. They get orders from a physician or APC and they execute the orders. This starts in nursing training. Often nurses trying to offer their opinion or expertise from the nursing point of view get shut down by physicians. Some people who go into nursing at some point (either in school or in practice) get frustrated with being relegated to “just following orders.” They leave the profession and go into some other line of work where their ideas are valued. This leaves a nursing workforce satisfied with following orders. Doing tasks. So, the Quality Management Departments are not manned with people who have a talent for systems thinking, which is required for building and maintaining reliable work processes. If you try to get them to think from a systems perspective, the usually leave. My observance of hospital and health plan Quality Management departments is there is a lot of nurse turnover. The ones that stay are usually doing accreditation and compliance work, which is task oriented. The staff charged with planning and implementing clinical improvements don’t stay very long because they are sort of scolded for getting no results. And, other than passing regulator and accreditor site visits, their accomplishments are usually meager. I owned Quality Management in three organizations. I actually built one from the ground up in one organization. After watching how difficult it was for nurses to drive process improvements and the frustrations they had to endure, I came to the realization that the type of person in Quality management had to change if I wanted to reach my quality and reliability goals. The first time I tried this was when I was the CMO of a health plan. I got to this health plan just as they were re-organizing. The Quality Management department was viewed as ineffective; the health plan could never get beyond a one year NCQA status (National Committee for Quality Assurance). The best status you could get was a three year accreditation, meaning, NCQA wouldn’t come back to audit you for three years. The Director of Quality Management was being “ushered out”. I had to hire a new one. I reviewed the job description and re-wrote it so being a nurse was “preferred” but not required. This was a hard sell with the HR department, but I got it through. I started receiving applications. One was from a Respiratory Therapist (RT) manager. I interviewed several candidates. All but the Respiratory Therapist were internal to the health plan and they were all nurses. The Respiratory Therapist not only impressed me with her systems and process improvement thinking, but she came in with a notebook detailing her self-started projects she had done in her department (on her own, not charged by hospital leadership). I knew she was the person I wanted. I hired the RT. I had to personally visit each of the other candidates to tell them they weren’t hired to keep the lid on things (rather than a phone call or letter/email). Some of the nurses left. We re-hired staff. Within a year, the RT Director of the Quality Management Department was the golden child of the health plan. She got Lean trained and was doing Kaizen events. We got a three-year accreditation the next year. Health Care Leadership is preoccupied with making money and growing the business, leaving little or no time to champion reliability. Health care leaders have a choice: Spend, like, $200,000,000 on hard-wiring reliable processes of care or building a new facility somewhere where they think they can gain market share. 100% of the time, the facility wins. In the last company I worked for, the spending for improving reliability was over 100 times less than building buildings and was less than their patient satisfaction initiatives budget. I’ll bet if someone did a study about this, they would find similar numbers throughout the US health care system. Rule #4: Don’t build another facility until the processes in your current facilities has an error and defect rate at least equivalent to Toyota. This has never happened in the history of Medicine. Don’t you think it should? Your life depends on it! The real bottom line is: The Health Care industry doesn’t have the will or talent to create and sustain reliable health care processes. Now that you have the current state of affairs, stay tuned for how to accomplish the degree of reliability in health care processes you deserve but are not getting now. That’s my next post. I don’t have to reiterate the degree of errors, defects, adverse events, harms and deaths due to unreliable health care processes. I don’t have to reiterate the incredible inefficiencies in the current health care systems, whether the delivery of care or the financing of health care (like insurance companies and government health care programs like Medicare and Medicaid). I don’t have to because you can easily Google umpteen references to these things. And this is a huge problem: all of the references you can Google are ignored. Ignored by health care. Ignored by Health Insurance Companies. Ignored by government agencies. Oh, sure, they give lip service to it and relate “ways” they are addressing these things, but the interventions are weak and not nationally organized. Sure, they can relate some interventions that are somewhat successful, like reducing central line infections in ICU’s. But what about PICC lines put in elsewhere? Why haven’t there been significant reductions of adverse events and deaths nationally overall? You’ll see all of these articles about saving money but the Medical Price Index is always 3-5 times the Consumer Price Index and cost is twice as high as any other nation’s. It’s because the current cultures and leaders of health care don’t have the will to make where you get your medical care reliable. In my previous posts, I’ve gone over a number of these things, so, now it’s time to offer solutions. It has to be inclusive. It has to not promote fear and reprisals. It has to promote learning. It has to promote listening. It has to use data wisely (data transformed into actionable information). It has to be intolerant of less than excellent execution. Reinstate Certificate of Need (CON). Place a moratorium on building new buildings and expanding health care services (unless there is a validated shortage that meets CON requirements) and funnel the money currently being spent on expansion into creating reliable and safe health care processes. For example, it costs (depending on the number of beds) between $200,000,000 and $500,000,000 to build a hospital. But hospital care processes are known to be inefficient and error-prone, so, the money is being spent to perpetuate the health care unreliability status quo. No hospital system has ever devoted (let’s use the low end) $200,000,000 to radically improving the reliability, efficiency and safety of the care processes in a hospital. Never. Not even over a two-year period (which you could argue is the time it takes to build a new hospital). Until the US nationally decides to do something like this, it will be a long time (or perhaps never) before our health care system has an error rate similar to Toyota. I already gave you an example of leadership that demands excellence and reliability (the Sakichi Toyoda story in a previous post). This mentality is absent in health care. Leaders don’t champion the types of tools and measurement systems that Toyota does. Companies that adopt the Toyota Production System (TPS) excel in reliability and competitive cost of product (like Hyundai, which was producing less than mediocre automobiles in 1993 and now rivals Toyota in reliability and cost. They adopted the TPS. And it was due to the CEO (relentless leadership. You should read the Hyundai Story.) How about Jack Welch’s adoption of Six Sigma at GE? Similar story. Leadership driven. Health Care leaders are too invested in making profits their legacy way (cost plus) and building new buildings and services, which has been the core competency of the health care industry leadership for 100 years (instead of safely and efficiently taking care of patients). So they are selected or self-selected for that purpose, not for making sure you get the right care at the right time in the right place without errors or defects or harm. Combined underpayments were $51 billion in 2013. This includes a shortfall of $37.9 billion for Medicare and $13.2 billion for Medicaid. For Medicare, hospitals received payment of only 88 cents for every dollar spent by hospitals caring for Medicare patients in 2013. For Medicaid, hospitals received payment of only 90 cents for every dollar spent by hospitals caring for Medicaid patients in 2013. Where is the AHA’s relentless program for reducing waste = reducing costs? Nowhere. It’s a cost plus strategy. Didn’t I already explain that experts from places like the Rand Corp. and the Institute if Medicine have estimated that there is 30-40% waste in the current system? These hospitals aren’t UNDERPAID! They have too much waste in their processes and their way of doing business. It costs too much for them to provide the services. Even if you took the lowest waste estimate (30%) and halved it you would get a savings of 15%, which means the hospitals would have a 3-5% positive margin on Medicare and Medicaid if they eliminated waste. But, instead, they have a VICTIM’s mentality. Ooohh, we’re underpaid! Poor us! Pay us more! How about getting busy and investing in efficiency and safety to be able to make money on Medicare and Medicaid instead of building that new hospital in the next suburb? There is actually a company called Premier that helps hospitals try to be less costly. They broker contracts for better rates for hospitals for supplies. They can show hospitals where there might be cost opportunities. The have a program called “Medicare Breakeven” that started in 2013, whose goal is to help hospitals re-design for efficiency and reduce costs so they don’t lose money on Medicare. If hospitals breakeven on Medicare, they have a +2% margin on Medicaid. Premier partners with almost 500 hospitals across the US. I wonder how many hospitals are enrolled in the program. I wonder if they actually made it to breakeven. I’ve never seen an article about it. I’m thinking, no one has made it yet or there would be press releases about it. 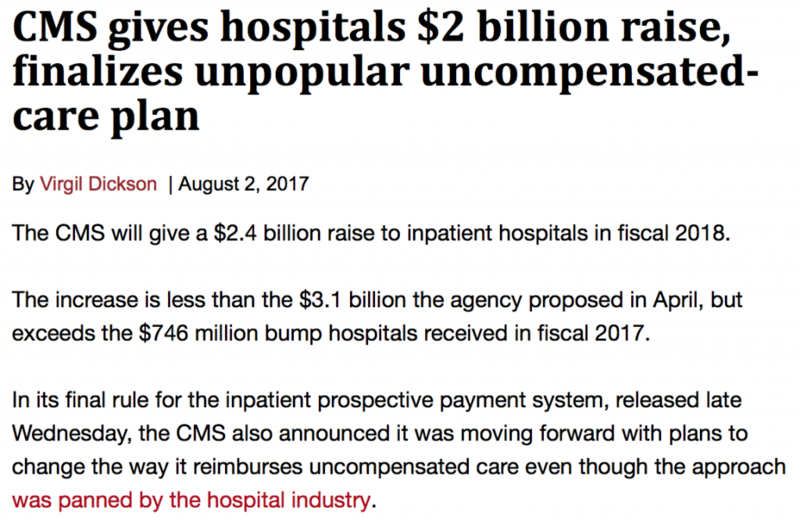 I know the hospital system I was in when I heard about this decided to decline to participate, and they were losing 12% on Medicare. They need to Lean out their processes, not get paid more. Solution 1. The Boards of Directors of health care institutions must start demanding excellence and reliability and drawing C-suite leaders from industries that have a proven record in safety and reliability. They must mandate the elements of being a reliable organization as described by AHRQ. Otherwise, nothing will change in health care. This is called demanding a culture of reliability. MBA colleges and universities need to start imbuing their students with product reliability and how to build and maintain reliability cultures, not just how to read spreadsheets and optimize profits. Maybe they all should have to certify as Lean Six Sigma Black Belts to get their MBA. Here’s an example of what goes on now. Financials rule. I was in an integrated delivery system. It was March and the Finance Department and CFO presented financial projections to the Senior Executives. Their findings projected that the organization would miss its profit margin by 1%, which in the company was, $13,000,000. Take note that I’m saying missing their margin, not losing money. Let’s say they budgeted a margin of 4%. The projections said it would be 3%, so, $39,000,000 profit instead of $52,000,000. The CEO, CFO, CMO and COO called all of the next level “down” leaders (so, the VP’s) into a room and told them that, as of the next pay period, their salaries would be cut by 10% (which apparently approximated $13,000,000) and they couldn’t get that money back unless they reversed the projected $13,000,000 shortfall PLUS ANOTHER $1,000,000!! Luckily, that happened and the VPs were “trued-up” in the first quarter of the next year. In my entire 45+ year career in medicine, I have never seen a health care system dock people’s pay because of not meeting a clinical goal, including goals for things like the Mortality Rate (yes, YOU DYING!! ), or NQF Serious Harm Events, or Readmission Rate, etc. If a health care system had a culture of clinical reliability, they would use the same tactics they use to make profits and grow and apply them to clinical measures. Like cutting people’s pay for missing a clinical goal. I don’t believe that has ever happened in health care. Not even places like the Mayo Clinic. We actually validated this with our own data, which said people staying in the ED longer than 10 hours had a higher mortality rate and length of stay. So, I’m in a strategic planning meeting in the Fall with all of the hospital’s Senior Leaders. They are proposing what the “threshold” measure (a goal that must be met) should be for Senior Leaders to get their annual bonuses. I proposed that we should choose “Zero boarders in the ED for longer than 10 hours.” I figured this would galvanize the Senior Leaders to analyze and process improve as a company-wide team to decrease inpatient throughput time and reduce the time boarders were in the ED, TO SAVE LIVES! I was the only leader to propose a clinical measure for bonuses. Did they choose that? Nope. They chose a financial measure. They chose a threshold within their core competency bandwidth. Not to be crass, but, basically guaranteeing they will get their bonuses. Moving a clinical measure was too risky. Solution 2. Senior Leaders must spend time “on the workplace floor” a significant and specified amount of time to truly experience what the systems and processes in their organizations are like. This was not an isolated incident. I would say 75% of physicians who get to the “full time” Medical Director level stop seeing patients. There was one physician hired into a Chief Medical Officer position that part of his role required applying medical judgment, which, in turn required that he have a license to practice, who, when he applied for the license, was declined a license on the basis that he hadn’t seen a patient for so long, the Medical Board wouldn’t approve his license because they felt he might not be competent anymore. The nurses are worse. I’ve NEVER seen a nurse who got into a full time Nurse Director or “above” position spend any time doing nursing on a clinical floor, be it inpatient or ambulatory. Never. And as far as the MBA’s (or MHA; Masters of Healthcare Administration), spending time on a clinical floor, or even an administrative floor, is viewed as equivalent to cleaning out septic tanks. Once they get promoted, they never want to “go back”. As a matter of fact, it’s hard to get them to do anything except hang out in their offices and go to meetings. Some will do “walk arounds” where they schmooze with staff then disappear. They are pretty clueless as to the realities of what is going on in their companies. Very different from the CEO of the Ritz Carlton who spends at least a week a year going to one of the Ritz Carlton hotels and doing a “job a day”, like being a housekeeper one day, doing room service one day, working in maintenance one day, etc. I really admire that guy for that. Anyway, at the next meeting they had the previous meeting evaluation comments at the back of the meeting packet. There were several comments next to the agenda item that included my plan that said things like “There is no way I can spend 4 hours every two weeks doing line staff work. I’m too busy” or “I don’t see how my spending time doing line staff work would be productive”, etc. See, no appetite to experience the dysfunctional processes they created or maintained. I was thrilled when Undercover Boss came out a year or so later. I revisited the subject using the experiences of the bosses on Undercover Boss as leverage, but, alas, I got the same responses. I’m sorry, but, unless you are personally experiencing what patients and staff are going through, you will never feel you are on a burning platform and motivate the company into making the changes that need to be made. Solution 3. Mandated adoption of models like Lean and Six Sigma by certifying and accreditation agencies. By the way, Lean and Six Sigma includes in their foundations The Improvement Model. Using The Improvement Model alone, which is an incremental improvement model, it would take 30-50 years to get to the degree of reliability you can get with Lean and Six Sigma in 5-10 years if they are implemented correctly. Cases in point, The Institute for Healthcare Improvement, which primarily relies on hospital system “collaboratives” using improvement models like “The Improvement Model” has had pretty negligible impact. They totally missed their 5 million lives campaign goal. Amusingly, they never even figured out how to measure it! And Intermountain Healthcare has used and taught The Improvement Model for 30 years. Their reliability rate is nowhere near Toyota’s or the Nuclear or Airline industries. This book is about mistake proofing. 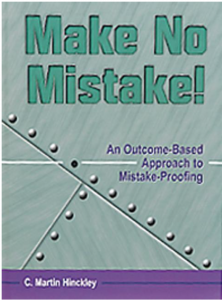 Mistake proofing virtually eliminates errors and defects. There are industries in the US where this book is a “bible” for their safety and reliability programs. Mistake proofing is a key element in Lean. It’s called Poka-Yoke. You especially want to use mistake proofing when 1. A human is a step in the process and, 2. A defect causes a catastrophic event (like a train wreck). Putting your car in gear or starting your car engine: The difference between Six Sigma and Mistake Proofing. As of 2015, 263.6 million vehicles were registered in the US. Assume that each vehicle moves twice a day. That results in 527.2 million opportunities for a car to lurch forward or backward if a car is in gear when the engine starts or with the engine running as the transmission is engaged. Six Sigma means you’ve improved a process so that there are only 3.4 defects or errors per 1,000,000 opportunities. If the process of starting your car or putting the car in gear was refined to the six sigma level, then the formula would be 3.4/1,000,000 x 527,000,000 = 1792 defects per year. In other words a car would lurch forward or backward, potentially causing injury or property damage 1792 times a year or about 5 times a day. Mistake proofing eliminates this potential. You cannot start your car or put it in gear unless you have your foot on the brake. Number of errors a year = 0. There are about 23,982,000 surgeries in the US per year. If you could “six sigma” surgical processes to avoid errors/defects, and assume that the maximum errors per surgery is one, that would be only 81.5 surgical errors a year in the US. For 5500 hospitals. Wouldn’t you want that as a patient? Here’s how weird it can get in health care. About 15 years ago, McKesson developed and released a robot to dispense medications in hospitals. The way the robot works is, medications are loaded into the machine in unit dose packets. The packets have a UPC code on it that has the medicine name (like aspirin), the type (like tablet) and the dose (like 325 mg). The robot is 99.999% error free and the 0.001% error is when the robot occasionally drops a packet, not that it picks the wrong packet (it then goes back an picks the next same, correct packet and delivers it so the error never reaches the patient) . It turned out at the time that the robots were deployed that no drug company supplied drugs in unit doses with the elements needed for the robot to pick the packet on the drug company produced unit dose packet. The UPC codes were on the box that contained unit doses or the drug only came in bottles with 30-90 tablets. And the UPC codes only included inventory control information. In order to have packets to load into the robot with the proper UPC coding, a person had to manually put the medicines into packets and create and print UPC codes to stick on the packets. Since a human doing only one task, on average, has a 2 sigma level error rate (5 errors/100 opportunities or 50,000 errors/1,000,000 opportunities), the entire robot process was only 2 sigma instead of better than six sigma. “In general, the level of mistake-proofing in health care is minimal or poorly implemented, but desperately needed. Perhaps a few examples can illustrate. Observing a nurse insert an IV, the materials were laid out in preparation. The order of executing the cleansing was done incorrectly twice. Each time the nurse had to go to a storage closet on the other side of the floor to retrieve the correct materials, and start over again. This added 10 minutes to the execution of the task. If someone had not been observing the process (even though I am not familiar with the correct sequence), it is not clear whether or not the nurse would have retrieved additional materials until the process could be executed correctly. The key problem is that the sequence is not an obvious part of the task. The correct solution would be to have an IV insertion kit, where each required item is presented in the correct sequence. Ideal would be a folded kit, where one and only one item can be accessed at a time, and then only in the correct order. Although there is a minor packaging cost to present the materials in this way, the risk of doing the task incorrectly is dramatically reduced and the elimination of wasted motion and materials more than pays for the expense. Observing phlebotomists, we watched as labels for vials were dropped (without detection by phlebotomists) as they departed to collect samples. At times, they selected the incorrect specimen label, or used the incorrect specimen vial. In a stat situation, this can result in delayed testing, and life threatening consequences. A better solution that would be relatively inexpensive would be to upload a prioritized list of draws to a bluetooth device. When the phlebotomist scans the patient’s armband, a portable printer (weighing just a few ounces) prints the exactly the correct number of labels, where each label has a symbol linked to the correct vial to use for each label. Because the labels are only available for each patient it is virtually impossible to select an incorrect label. All required specimens are collected, and errors in using the wrong vial can be completely eliminated. EMAR carts represent an example of an extremely poor implementations. The intent is that the nurse scans the meds and the patient’s armband to assure that the meds are consistent with the patient needs. Unfortunately, moving the carts into the room creates a major problem for nurses. It takes longer than traditional methods, and if an urgent situation arises, they can not leave the cart unattended without securing the meds. To avoid these problems, nurses scan the barcodes in the patient books at the nurses station, circumventing the entire purpose of the EMAR carts since the nurse may then deliver the meds to the wrong patient. Good mistake-proofing always makes the process easier. As an alternative to an EMAR cart would be a small secure box prepared for each patient. The nurse carries the small box with a barcode scanner to the patient’s bedside. When they scan the patient’s armband, the scanner provides a bluetooth signal which is detected by the box. If the box matches the patient ID, the box opens. Now, the nurse doesn’t have to push a cart around. The equipment and use is significantly simpler. In an urgent situation they can simply close to box to the secure the meds and leave it in the room (rescanning the correct patient armband reopens the box). We have observed similar problems in Clinical Chemistry, in OR with tool packs, in Emergency Rooms, in the arrangement heart catheters, in cleansing of scopes for colonoscopies and so forth. I’m here to tell you that the majority of health care interventions in process improvements are in the low impact section of the above chart. Health care needs more high impact solutions. An error occurs that makes it to the attention of the risk management department or the quality department. It’s usually something big, like a sponge or instrument left in a patient, a wrong side surgery, a patient seriously harmed by something a staff person or a doctor did or ordered. As per Joint Commission standards, a root cause analysis ins done to determine what could have been done differently and the quality committee or department recommends a change in the process. The staff is “trained” (again, really educated) and it is presumed the recommended changes are happening. There is no measurement of compliance to the new process to ensure a) the staff are compliant with the new actions and 2) that the new process step change actually worked. Plus, it is one hospital’s answer to a national systemic problem. So, there are 5500 different ways people are trying to make things better. Wonder why it is taking so long and progress is so slow? What should be done is like what happened with Central Line Infection Prevention (except they didn’t go “all the way”). Dr. Pronovost and his team proved that by using a certain protocol, central line infections could approximate zero incidence. What didn’t happen is the protocol wasn’t mandated nationally. Adopting it is voluntary. I guarantee you every hospital in the US isn’t following that protocol. To prove my point, read “Wrong Site Surgery”; Kathryn E. Engelhardt, MD; Cynthia Barnard, PhD, MBA; Karl Y. Bilimoria, MD,MS; JAMA November 28, 2017 Volume 318, Number 20; pp. 2033-2034. Here’s the URL so you can read it. https://jamanetwork.com/journals/jama/article-abstract/2664463. Notice how often they say what they recommend “may” do something. No proof. They admit that their interventions are solely relegated to their hospital/hospital system. I actually can’t figure out why JAMA would even publish this weak article except their editors are probably as clueless about what it takes to make true improvements as the rest of health care leaders. 1. There usually isn’t a measurement system set up to monitor and prove success. 2. The intervention is hospital or hospital system specific and is usually created and implemented by process improvement amateurs. 3. Most interventions are weak and people based, meaning prone to error, distraction and apathy. 4. Interventions are not nationally organized and are always voluntary/optional. Until this changes not much progress will be made. What is needed is funding similar to the way biomedical research is funded, maybe through the NIH, and process improvements, like the central line infection protocol, when proven to be truly effective, should be mandated for every hospital in the nation. This category is especially irritating to me. With few exceptions, health care Quality Committees are made up of these following types of individuals: Board of Director members, C-Suite Execs, VPs, Executive Directors and Directors. Who is missing? Line staff (like nurses doing nursing, Physicians and APC’s who are seeing patients, clerical staff working at patient contact sites or in cubicles), and, most importantly patients. I actually got to do this in one health care organization. It was because I was running a region of the organization and the C-suite guys were 80 miles away. We had a practicing physician, an APC (both had to not have any administrative duties), a clerical person (like telephone switchboard operator) and a staff nurse on our Quality Committee. The remainder of the committee was staff who were required to be on it by NCQA (Administrator, Medical Director, Marketing Director, Quality Manager, Utilization Manager, etc.). You have no idea how many times the “non-traditional” members of the committee would say, “What, you guys really think that would work?” or “I need to talk about this with my peers and I’ll report next committee.” Otherwise, the “administration folks” would have gone forward. The other perk with having these “non-traditional” folks on the committee is, they would tell their co-workers what was going on and why (minus any confidential information, like case reviews). The Quality process became transparent to the staff. Can you imagine the committee member who was a telephone operator talking about the committee over lunch with her co-workers? Unfortunately, that was the only place I could get this to happen. Too much elite-ism and too much fear on the part of the Execs of folks like line staff, physicians/APCs and patients knowing what was going on. Unless the Quality Committee make-up is changed as noted above, don’t expect meaningful changes at the necessary speed required to make a difference. Ok, I’m going to say something that probably all of the Medical pundits will call heresy. Everyone should stop using risk adjustment to create and manage/maintain clinical improvements. I’ll say it again. Everyone should stop using risk adjustment to create and manage/maintain clinical improvements. For those of you who don’t want to hear this, read my lips: Everyone should stop using risk adjustment to create and manage/maintain clinical improvements. Hospital “A” has a mortality rate for heart attack of 3%. Let’s say Medicare doesn’t allow a mortality rate higher than 2% and would penalize this hospital if their risk score is 1 or less. But, due to the bills sent in by the hospital and other providers caring for Medicare beneficiaries in that hospital region, the Medicare Risk Adjustment model says Hospital “A” has a severity weight of 1.5. They divide the actual mortality rate (3%) by the severity weight (1.5) and the rate is risk adjusted to 2%. Voilà! No penalty. But wait! 3% of the patients actually died! Is that OK? So, what happens now is, Hospital A says it is “doing OK”! They didn’t get penalized. They don’t have to do anything about people dying from heart attacks. This is the problem with risk adjustment. Hospital “A” now has a false sense of security relative to its heart attack patients. And, since hospital Quality Departments prioritize working on regulatory and accreditation compliance over anything else, which includes things like Medicare penalties, Hospital “A” will take improving heart attack care off their work list. After all, they didn’t get penalized. The CEO and CFO won’t be on their backs about heart attack mortality because no money was lost in penalties. So, the hospital had to pay a penalty! Turns out, the lower risk score was due to inadequate coding on the bills being sent to Medicare by the hospital and the providers in that hospital region. It wasn’t that the patients were really less sick than the average Medicare beneficiary. Here are the problems with risk adjustment. The Risk Scoring Models are imperfect models. Most are linear models using R-squared calculations and Mean Absolute Error (MAE) to report accuracy. Most are only up to 50% accurate for concurrent risk scoring (meaning where a patient’s risk is right now) for “Commercial” populations (ages 0-64) based on R-square. That means they are at least 50% wrong. It’s much lower, in the 15-20% range for “prospective” risk (trying to predict if a patient is going to be worse or better)(Accuracy of Claims-Based Risk Scoring Models; Society of Actuaries, 2016). The MAE’s are ~100% (An MAE of zero would indicate that the estimated risk score was always perfectly accurate). The smaller the population, the lower the percent accuracy. When you get down to the individual person level, you might as well have a monkey throw a dart at a matrix of risk scores tacked to a wall. The models vary in accuracy based on how you filter them. For example, they are pretty accurate when dealing with the group: “top 1% of spenders”. But that seems logical because of the narrow bandwidth with relative similarities of conditions of the most ill patients. These models are better used to assess groups of over 10,000 people or people who are already really sick. There are some emerging non-linear models out there now using things like machine learning. They are too new to fully evaluate yet. The Society of Actuaries evaluated one model and found the R-squares lower than the linear models, but the MAE’s were better. Still a work in progress. Maybe they need different measures than R-squared or MAE, since they are non-linear models. Risk adjusting/Severity weighting requires a comparator group. What this means is, your population is compared to another population or group of populations to get “severity rating”. You usually end up with something like an “index” or observed vs. expected ratios where 1.0 is average, below 1.0 is better then average and over 1.0 is worse than average. Each model uses different comparator populations. For example, MIDAS, a time honored hospital Quality Department data tool, uses about 800 hospitals, only 85 of which are categorized as a >400 bed hospital. The other 715 are smaller hospitals. Premier has about 500 hospitals, 80% of which are >400 bed hospitals. Not the same populations. Even though you can “filter” by hospital size, the statistical reliability based on 400 hospitals (Premier’s 80% of 500) is different from just 85 or so >400 bed hospitals in MIDAS. I’ve actually had the same data submitted to both of these companies and gotten very different results for the presumably same measure (mortality index). This is true of all severity weighing/risk adjusting models. So, if the comparative group is performing poorly and you are performing a little less poorly, you look good, but you are really still not good. You are just the best of the bad. The whole risk adjustment idea inhibits motivation to improve care processes. And clinical folks feel assured when their index is 1.0, when that is the “average” or, in other words, usually, mediocre. With an index of 1.0 they feel that they don’t have to do anything to get better. Scoring a 1.0 is an OK place to be to them when really it isn’t. Unless of course, everyone is performing almost perfectly, which isn’t the current reality. Risk adjustment/Severity weighting and Risk Scoring models rely on bills submitted by hospitals and providers. So, the final scoring depends on how good a hospital or provider is with coding admissions or visits. You can be terrible at coding and doing a great job taking care of patients and get dinged by Medicare or an insurance company. Or, you can game the coding system, not be taking care of patients well, and look really good! Believe me, I’ve seen both of these things. Here’s an example. 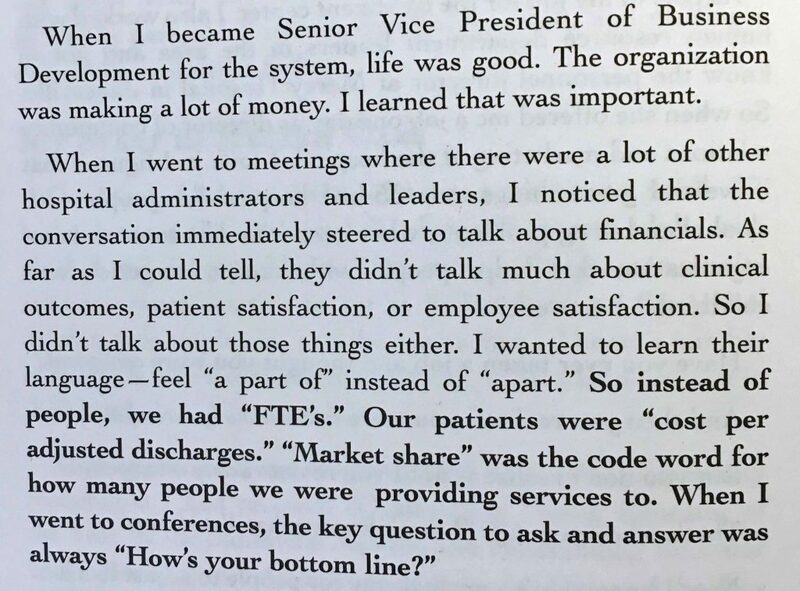 A nurse in Michigan was working for a consulting group who went into hospitals and showed them how to “optimize” their coding. The nurse left the consulting company and got a job in the Claims Department (remember, a claim is a bill when it reaches an insurance company) of our health plan. Her job was looking for hospitals and providers who were “over-coding”. That could be coding for something that really didn’t exist or unbundling services that were considered part of a global service and should be billed inclusive to the global service code. So, this nurse went to the same hospitals where she taught them to “optimize” their coding and did audits against “correct coding’” to look for “over-coding” and then discounted the same coding she had previously taught them as being optimal coding as now being coding abuse!! That led to reductions in the hospital’s reimbursement. The hospitals angrily ushered her to the door of the hospitals and told her to never return! What do you think that did to the hospital’s risk scoring? For the health plan I was in, the risk score went down. For insurance companies that didn’t do the audits that nurse did (or Medicare) the risk score was higher. There is a high degree of variability in the way each model is calculated. This means you can look good in one model and bad in another. When I was a Medical Director in insurance companies, this was the biggest complaint of providers. They would have contracts with several insurance companies who were profiling them for payment rates and quality outcomes and bonuses. Each insurance company told them something different. To the point where the variation was so high, the providers just tossed the profile reports in the trash can. I had a network Pediatrics group tell me that our profile results said they were in the worst quartile of risk adjusted performance and our biggest competitor said they were the best Pediatric group in their network! In reality it can’t be both! It was risk adjustment methodology differences. “Vendors applied their risk-adjustment algorithms and provided predicted probabilities of in-hospital death for each discharge and for hospital-level observed and expected mortality rates. The proportions of discharges that were included by each method ranged from 28% to 95%, and the severity of patients’ diagnoses varied widely. Because of their discharge- selection criteria, two methods calculated in-hospital mortality rates (4.0% and 5.9%) that were twice the state average (2.1%). Pairwise associations (Pearson correlation coefficients) of discharge-level predicted mortality probabilities ranged from 0.46 to 0.70. Hospital-performance categorizations varied substantially and were sometimes completely discordant. In 2006, a total of 12 of 28 hospitals that had higher-than-expected hospital-wide mortality when classified by one method had lower-than-expected mortality when classified by one or more of the other methods. So, there you have it. These models are too imperfect to be used in creating and maintaining reliability and safety of processes in health care systems. They could be useful in following progress over time, like measured annually, to see if health care improvements are making an impact in a population, or for actuaries to use for large groups of beneficiaries in insurance plans, but risk adjustment/severity weighting should not be applied when managing the processes of care. The Raw Rate is the better measure. And the goal rate should be the Raw Rate, not an index or risk adjusted. As I said, this stance is heresy in health care. Even an esteemed physician leader from the Mayo Clinic told me I was nuts. But, he really didn’t know anything about clinical process reliability. That’s because the first thing a health care provider (using the term generically) will say when they get a report that doesn’t look so good is, “Well, MY patients are sicker!” And you have to prove that is or is not the case before they will talk to you again. So, the risk adjustment paradigm became “the law” in medicine. Then it got applied universally, when it should only be used for certain situations. It’s like an airline who has various airplane sizes from Boeing 727’s to 747’s being allowed to have more crashes than an airline with only one size, like a Boeing 737 because the variety of airplanes has an increased theoretical complexity risk due to pilots needing to know more to fly the various planes and the mechanics have to know more relative to servicing the various airplanes. You can hear the CEO now saying, “Well, MY airplane situation is more complex than the other company’s”. US health care systems and their leaders do not have the will or training to create reliable health care processes. The Boards of Directors of health care institutions must drive the culture of reliability. There are five solutions that, if implemented forcefully and fully in the US, would dramatically improve health care process reliability. The possibility that anything in this post would be adopted by the US health care system is unlikely. The US (and sometimes global) medical community has not infrequently accepted and disseminated medical practices that ended up harming, including killing, millions of patients. If you want to learn more than what is in this post, just Google “medical treatments that harmed more than helped”. Here are just a few that not only became accepted standard of practice, but doctors were unwilling to stop them when they were proven wrong. Some of these I’ve already described. In the late 1800’s and early 1900’s doctors began treating acne with x-rays. There was very little knowledge or understanding of the long-term consequences of x-ray treatments. The patient’s skin looked better. That’s all doctors focused on. As it turned out, x-ray treatment for acne caused thyroid cancer, parotid (salivary gland) and parathyroid tumors. Some doctors were still using the treatment in the 1990’s even though a causal relationship was suspected and proven before 1960. Yes, a hundred years of using a treatment for a non-life-threatening condition whose side-effects were life-threatening, despite warnings. In the mid-late 1970’s and really peaking in the 1980’s, the Cardiology Societies and literature fanatically promoted a low-fat (including a no-fat), low cholesterol diet for primary and secondary prevention of heart disease, mainly heart attacks. It turns out the research was funded by the Sugar Industry. This was revealed in a 2016 article published in JAMA Internal Medicine (Sugar Industry and Coronary Heart Disease ResearchA Historical Analysis of Internal Industry Documents; Cristin E. Kearns, DDS, MBA; Laura A. Schmidt, PhD, MSW, MPH; Stanton A. Glantz, PhD; JAMA Internal Medicine Published online September 12, 2016). This resulted in people switching from their current diet to as low a fat and cholesterol diet they could get. The food industry flooded the market with low or no fat food products, like Snackwells, that were predominantly carbohydrates (lots of sugar) and processed grains. Around this time, the average daily caloric intake increased from~2000 calories a day to ~2600 calories a day without a commensurate increase in average daily caloric expenditure. Some experts assert that the low/no fat diets fueled the increase in caloric intake, as carbohydrates don’t create long-term satiety (that’s why you get hypoglycemic and start looking for something to snack on at 10:00 AM when you eat a predominantly carbohydrate breakfast at 7-8:00 AM). You need a certain amount of fat and protein to suppress hunger and maintain an adequate blood sugar level. So, the Sugar Industry started, guess what, making a lot of money. In the meantime, the obesity epidemic started. This has resulted the Diabetes Type 2 epidemic, which is killing people from complications of diabetes, including, guess what, HEART ATTACKS! And, for decades, there has been plenty of evidence that MOST HIGH CHOLESTEROL IS DUE TO GENETICS NOT DIET! Most of the high cholesterol in your blood is internally created. Diet accounts for less than 15% of the cholesterol in your blood. So, now, recent guidelines downplay diet, since it doesn’t contribute that much. Here’s a quote from the Cleveland Clinics website: “Research is beginning to show that your genetic makeup – not diet – is the driving force behind cholesterol levels. About 85 percent of the cholesterol in the circulation is manufactured by the body in the liver”. By the way, this has been known for at least two decades, so the “research is beginning to show” statement is a little disingenuous. The result of all of this misinformation and Cardiology fanaticism is The Obesity and Diabetes Epidemics. These were foisted on the US and global population by the Cardiologists and flawed research. I remember when the Cardiologists bashed the Atkins Diet, which is low carbs, high fat/protein dieting. Now research is showing that’s better for weight reduction and maintenance than the low fat diet. So, millions of people are dying due to fanatical promotion of a dangerous lifestyle by medical specialists. As a primary care physician I always was suspicious about the low fat diet. But, I had to recommend it because for 40 years the “guidelines” promoted it and I would get into trouble (and potentially get sued) for deviating from these guidelines (See my post about “Why Health Care Costs So Much – Part 3 – Overtreatment”: The science isn’t as scientific as it looks”(http://www.truthsabouthealthcare.com/costs/overtreatment/). Now we have the Opioid Epidemic. I’m not going to get into this one here as I have an entire post on this (See: “The Real Story Behind The Opioid Epidemic” (http://www.truthsabouthealthcare.com/general/the-real-story-behind-the-opioid-epidemic/)). All I’m going to say here is, the Opioid Epidemic was totally avoidable if the medical community did its due diligence instead of blindly following the American Pain Society (another specialty fanatically promoting unsubstantiated evidence) and the VA and The Joint Commission. I personally never got caught up in this because I never prescribed opioids for chronic pain; I used non-medication interventions for chronic pain. So, now we have THREE epidemics caused by and maintained by the medical profession, fueled by the physician specialists who got carried away. I already posted about this one, too. A “standard of care” based on faulty, and even falsified, medical evidence and then fanatically promoted by Oncologists. See my post titled “Why Health Care Costs So Much – Part 3 – Overtreatment” (http://www.truthsabouthealthcare.com/costs/overtreatment/) for a more detailed description of this one. Women dying of the treatment more than the disease itself. Again, I already commented on this (See my post about “Why Health Care Costs So Much – Part 3 – Overtreatment” (http://www.truthsabouthealthcare.com/costs/overtreatment/ )). Major promotion of giving post-menopausal women Hormone Replacement Therapy (HRT) by Endocrinologists and OB/GYNs, which was said to prevent heart attacks, strokes, cancer, etc, when it actually had a detrimental effect on women’s health to the point where the mortality rate was higher in women treated with HRT. Now it is considered malpractice to treat most women with HRT. Millions of women killed by a treatment fanatically promoted by physician specialists. And I’m not even getting into Patient Safety, which is a process deficiency issue killing at least 250,000 people a year because neither health care institutions nor physicians see the incredibly urgent need to make health care systems and processes as reliable and error free as possible. The bottom line is, be wary of anything being fanatically promoted by medical specialists, drug companies or hospital systems. Your life may depend on it. A good rule to live by is “everything in moderation”.